I had never tried anything from Shiseido before trying this cleanser and it certainly made a great first impression of the brand. I received this as part of goody bag at an event and I was delighted with it. It was a big decent size and lasted me ages. 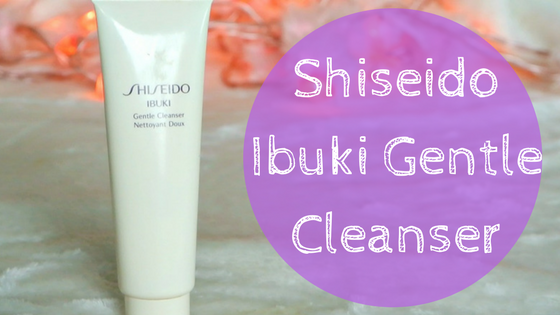 This cleanser is from the IBUKI range. It's a cream cleanser that foams up when you add a little water. It is fragranced but doesn't make my sensitive skin react in any way. It smells beautiful, fresh and somewhat floral. I'm not big on skincare that has an overpowering scent to it but this is actually beautiful. I actually don't have anything negative to say about this cleanser except maybe the price is a bit steep. It's €38.50 for 125ml. However I do think it's worth it and it will last you absolutely ages. It's difficult to find online, your best bet is to go into a store and find it, I've seen it in Debenhams and Shaws. The only place I seen it online was on feel unique! I personally love using it with my electronic cleansing brush as it lathers up really well and leaves my skin super soft and smooth. This is definitely a cleanser that I think is worth the money and lives up to the hype. I definitely will be repurchasing it as some stage. SO have you tried this cleanser? Or anything else from Shiseido's skincare range? Tell me your thoughts in the comments!